Daughter of the actor Thomas Ternan and the actress Frances Jarman. She was born in the United States on a steamship in Delaware Bay. As a young child she was already acting and dancing on the stage. She moved to Florence to study opera and later she was employed there as governess to the daughter of the author Thomas Trollope, whose wife had recently died. Allthough he was 25 years older they married in 1866. She wroted books like her husband and together they put together a volume on travel in Italy. Among her own novels was "Madame Leroux". After her husband died in 1892 she wrote a book about her mother in law, Theodosia Trollope. She returned to England and lived in Southsea with her sisters Nelly (who had been the secret mistress of Charles Dickens) and Susanna. 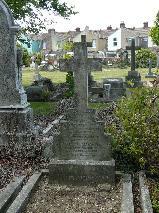 The grave of Frances Trollope and Susanna Taylor at Highland Road Cemetery, Portsmouth.